Doctor Vo Quang Minh has been Associate Senior Retinal Consultant at Cao Thang Eye Clinic in 2018. He specializes in examining and treating the eye diseases relating to retina such as floaters, macular degeneration, diabetic eye disease, retinal detachment…and cataract surgery (Phaco). Dr. Vo Quang Minh graduated from The Ho Chi Minh City University of Medicine and Pharmacy in 1984. He also completed the Specialist Level I in Ophthalmology at The HCM City University of Medicine and Pharmacy in 1990. 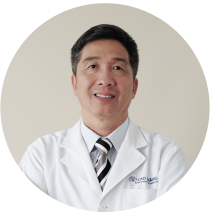 Dr. Minh completed his Master of Medicine – Med (Ophthalmology) at HCM City University of Medicine and Pharmacy in 2000. Additionally, he was able to defend his PhD thesis successfully at Hanoi Medical University in 2007 with topic “Evaluating the effect of Photocoagulation in Central Serous Chorioretinopathy treatment”. He is the Lecturer and was the Former Dean of Ophthalmology Faculty at The Ho Chi Minh City University of Medicine and Pharmacy. He has worked for Retinal Department of Ho Chi Minh City Eye Hospital. 2002 The author of the research “FFA Application for CSCR Diagnosis”. 2006 The author of the research “Initial findings of the results of Central Serous Chorioretinopathy”. 2009 The collaborator of research “Consideration about clinical features and results in treating irregular external strabismus for children”. 2010 The collaborator of research “Analysis about macular trauma in central retinal artery occlusion with Tomography and OCT”. The collaborator of research “Relation between Fluorescein Angiography and Retinal tomography in Diabetic macular edema”. The collaborator of research “Relation between central retinal thickness by OCT and visual acuity in Central serous chorioretinopathy”. 2011 The collaborator of research “Evaluation of using Bevacizumab (Avastin) in treating Macular edema caused by central retinal artery occlusion”. 2007 The editor of the book’s name “Clinical Ophthalmology” of the chapter “Vitreoretinal disease”. The editor of the book’s name “Paraclinical Ophthalmology” of the chapter “Diagnostic ultrasound on Vitreoretinal disease”. Experiencing issues with your vision?